Blueblood Masterstroke won on his only start at two before rising rapidly through the ranks at three. A sound racehorse, he won his second career start by two lengths and was narrowly beaten in both the G2 Prix Hocquart and G3 Prix du Lys. With the 2012 G1 Prix de l’Arc de Triomphe firmly in his sights, Masterstroke won the Listed Prix Frederic de Lagrange and bettered his elders with a record-breaking victory in the G2 Grand Prix de Deauville, winning in a faster time than Cirrus des Aigles, Swain, Snurge and White Muzzle. In Europe’s richest and most prestigious race, Masterstroke drew wide, but despite the poor draw he ran a credible third to Champions Solemia and Orfevre, finishing in front of G1 winners Camelot, St Nicholas Abbey, Saonois, Shareta, Meandre, Bayrir and Great Heavens. In his five Black type starts at three, Masterstroke never finished out of the placings. Spectacularly well bred and with the ultimate stallion’s pedigree, Masterstroke is by the influential Monsun and is out of a dual Oaks-placed half-sister to the 140-rated Sea The Stars and Champion sire Galileo. 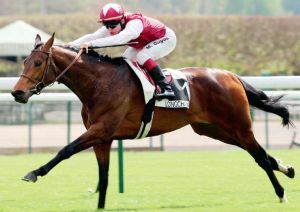 Masterstroke will stand at Haras du Logis for a fee of €3,000. For further information please call Sam Bullard on +44 (0) 1638 730 070.